Interlocutor... Moving on to another topic, Was there extraterrestrial presence (UFOS) at the Twin Towers in the moment of the attacks? Ruanel: Plainly, I tell you yes. Interlocutor: Did they know somehow in advance that the terrorist attack was going to happen and for that reason they were present? Ruanel: No, they were not present when the first attack happened, but they went immediately and they could witness the second attack. Interlocutor: How many ships were there? Ruanel: At least there were ten ships. Interlocutor: Was there some censorship with the pictures and films showing UFOs? Ruanel: No, there was none. And they wouldn’t have been able to censor them because they were immediately published through the Web. Interlocutor: Did they intervene somehow? Interlocutor: Did all the ships belong to the same extraterrestrial race? Ruanel: Correct. There were no ships from other systems. Interlocutor: Did they rescue people? Ruanel: No, they only witnessed. 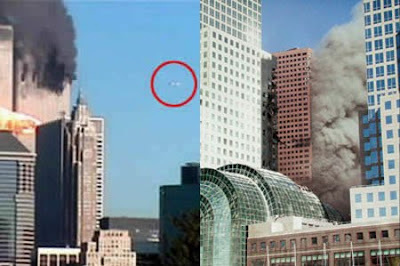 WHAT HAPPENED TO THE WTC 7 BUILDING? In 1997, The US Marine picked up a strange sound by means of a system of hydrophones distributed by the whole Pacific American coast. These microphones had the mission to detect the movement of Soviet submarines during the cold war. The NOAA system  picked up some sounds that baffled the scientists. According to NOAA its ultra low-frequency increased quickly during one minute and it had enough power to be picked up at distances up to 5.000 kilometers. The results of the signs captured respectively during a time lead to several conclusions: noises from animals, machines, etc. Do you recognize it, Master? Ruanel: It was an extraterrestrial ship from Anthea that directly was on the sea bed to be repaired. Interlocutor: Nothing more than that? Ruanel: Neither more nor less. Interlocutor: Good, neither more nor less. Ruanel: Should we conclude the session here. Interlocutor: Wait a second Master! this is very easy. It is about the WTC building 7 that collapsed after the Twin Towers did. Why did it collapse? Ruanel: It was caused by controlled demolitions planted by those people I said before. This building had to collapse to erase evidence of the whole conspiracy. Interlocutor: Everything is clear. See you later, Master and Thank you. NOAA System: National Oceanic And Atmospheric Administration. United States Department of Commerce. This entry was posted at Friday, September 11, 2009 and is filed under Extraterrestrials . You can follow any responses to this entry through the .